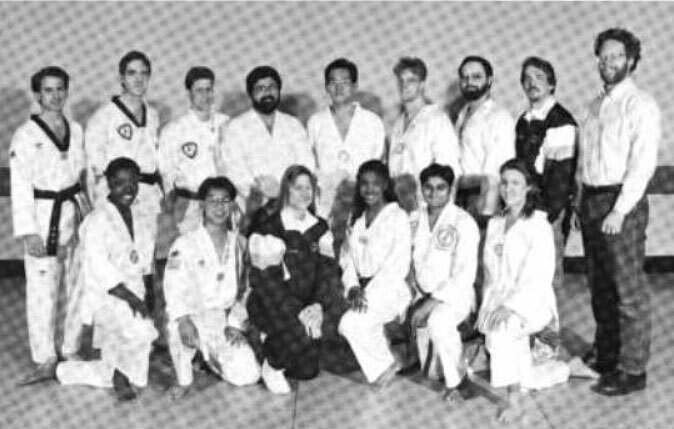 One of the constants of the U-M Taekwondo Club from 1968 to 1999 was the presence of Master Joseph Lloyd. Master Lloyd served as Head Club Instructor for most of that time. Master Lloyd also supported Grand Master Chong in the USTU, serving as legal counsel for a number of years. 1994 U-Michigan TDK Club portrait. Front row: Natalie Bennett, Daniel Moon, Laura Kistler, Jerilyn Bell, Rakesh Patel, Gudrun Scholler. Standing: Gary J. Gross, Steve L. Busch, Mark A. Rampy, al Salzar, Han S. Lee, Doug Winstanley, Roland Spickermann, Michael Spigarelli, with head instructor Joseph Lloyd at far right. In early 1999, Master Lloyd observed that a number of the Club officers and senior members were not attending his workouts. He called a meeting and requested that the upper belts write mission statements for the Club. The officers stated that the Club should first be a social entity, and that Taekwondo was secondary. They said that the Club should be fun, and that working on fundamentals and basics were not fun. Although several senior Club members supported him, Master Lloyd saw a significant disconnect between Club officers and what he wanted to teach. He shortly thereafter submitted his resignation to Master Chong. Master Nicholas Bissoon-Dath took over as head Club instructor. In 2000, the first Big Ten Taekwondo Conference Championship was held at MSU. The Club sent a team and took second. President Josh Rosenblatt volunteered to host the 2001 championships. Aided by instructors Master Bissoon-Dath, Steve Busch, and Tony Winkler, along with officers Michelle Anderton, Bohua Yu, Chrissy Dallas, and Kent Winter, the tournament was a success. The University of Michigan took first place, narrowly defeating MSU. OSU, Purdue, and Indiana all sent teams. Unfortunately, the Big Ten Taekwondo Conference was unable to find a host for the next tournament. In 2002, the Club suffered another loss when Chrissy Dallas passed away. A popular member and officer, Chrissy had helped support the class by recruiting fellow kinesiology students to enroll. In 2003, alumnus Scott Shugar died in a scuba diving accident. Both Scott and his daughter Dale had earned black belts from Master Chong, Dale being only eleven years old at the time. The new century has seen an influx of new black belts who have contributed to the continued success of the Club. These include: Naji Husseini, Sigrun Karlsdottir, Elliot Morrison-Reed, Daniel Santiago, Mike Walsh, Dan Kim, Shendi Wang, Jacqueline Cole, Sadegh Arab, and Jorge Renato Peña Alarcon. Under their leadership, the Club has been successful at a number of tournaments. Mr. Husseini and Dr. Cole, in particular, have contributed greatly as leaders and instructors since 2006, during which the Club has seen a resurgence in its membership to over 100 people and a renewed commitment to national and collegiate competitions, primarily as part of the Eastern Collegiate Taekwondo Conference. In 2008, Master Nicholas Bissoon-Dath decided to retire from his position as Head Club Instructor and shortly after relocated to California. His place was taken by Master Steve Busch. A Club member since 1987, Master Busch had been assisting both Master Bissoon-Dath and Grand Master Chong.